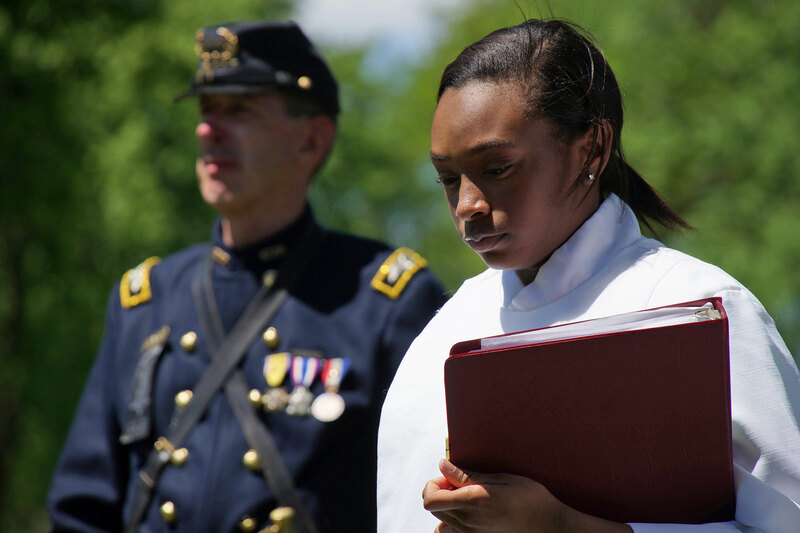 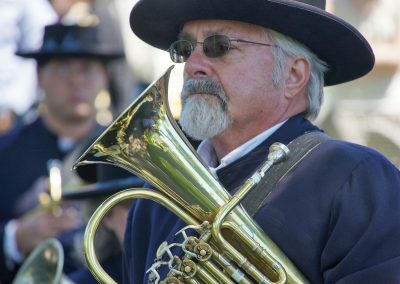 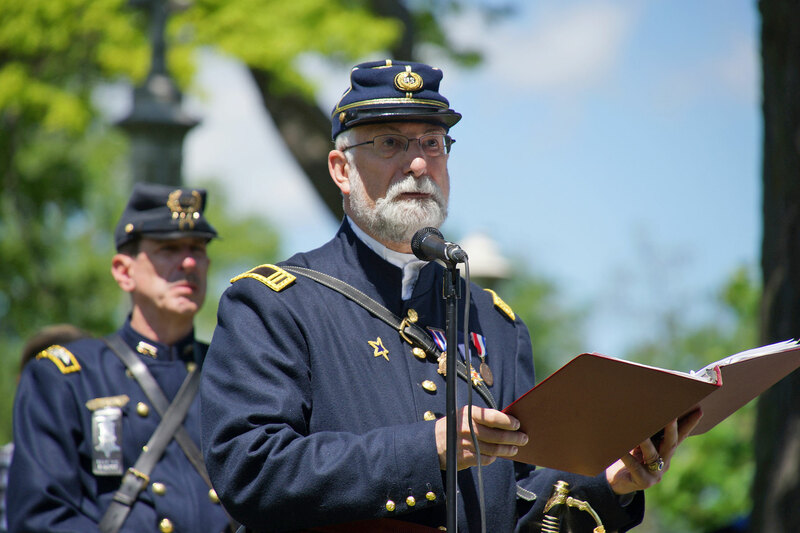 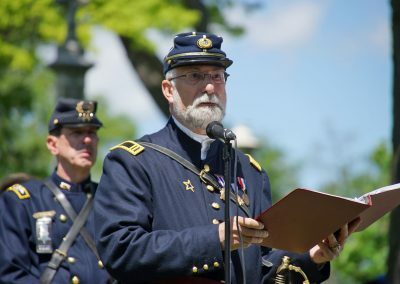 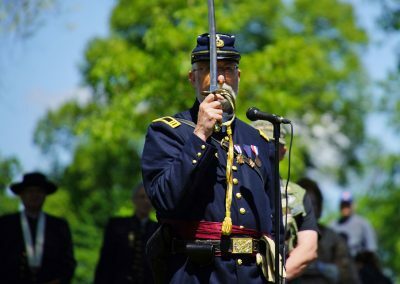 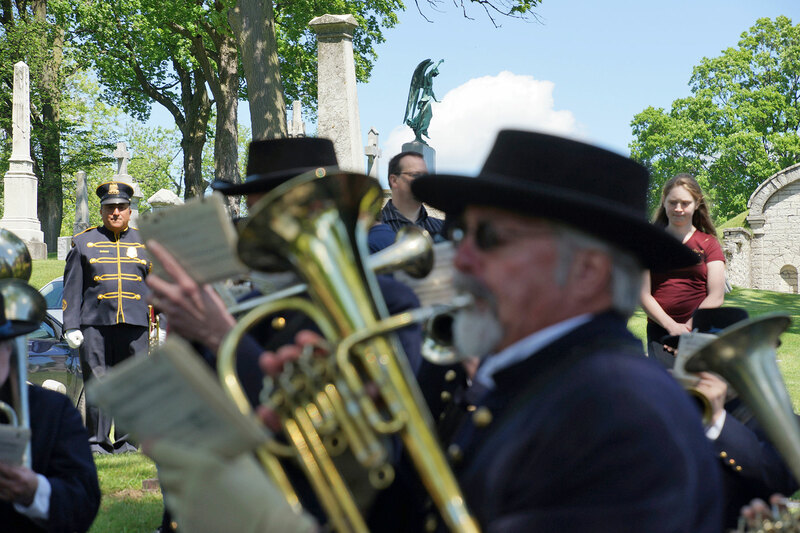 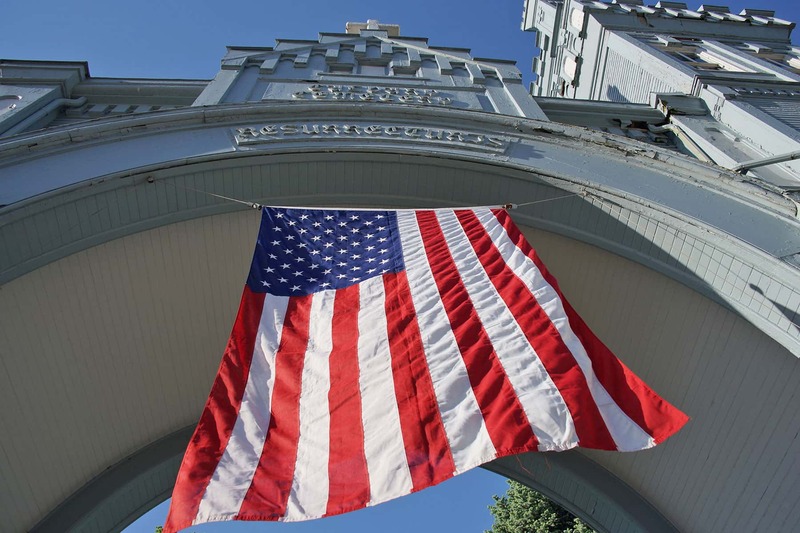 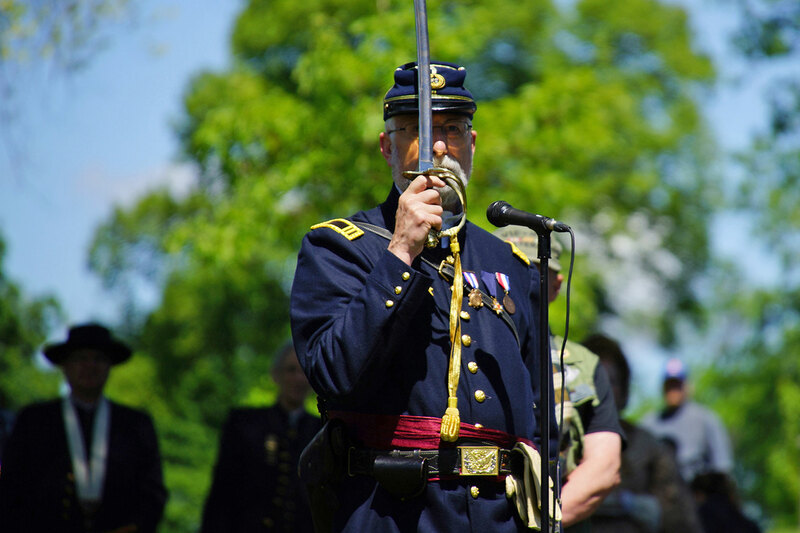 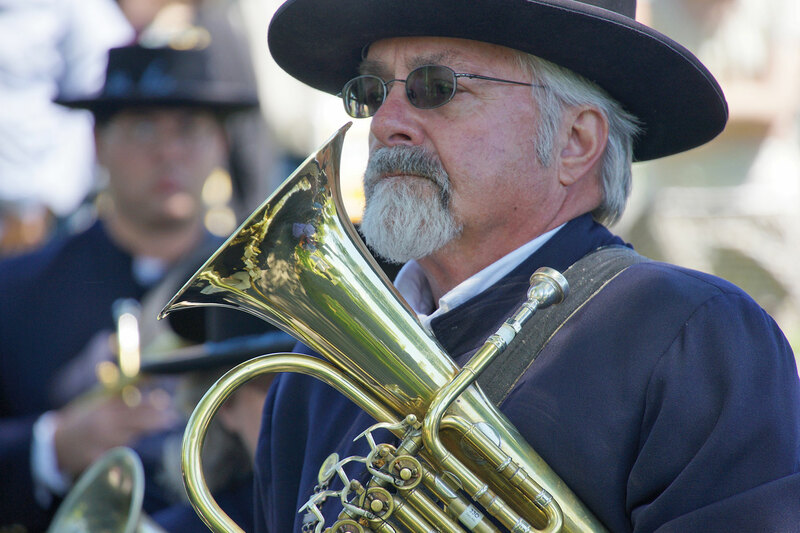 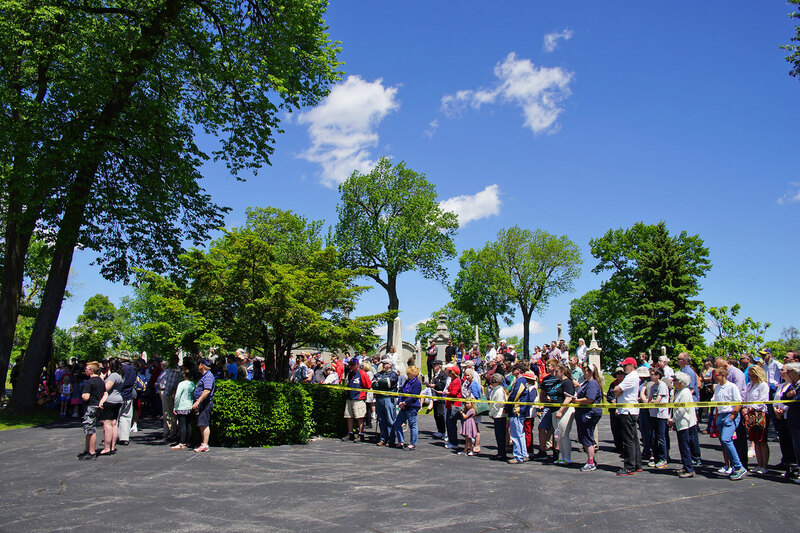 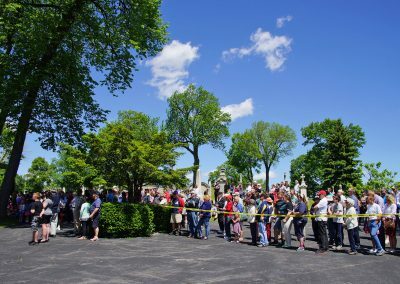 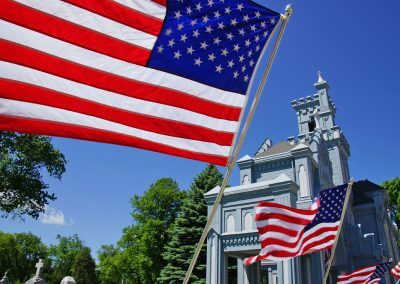 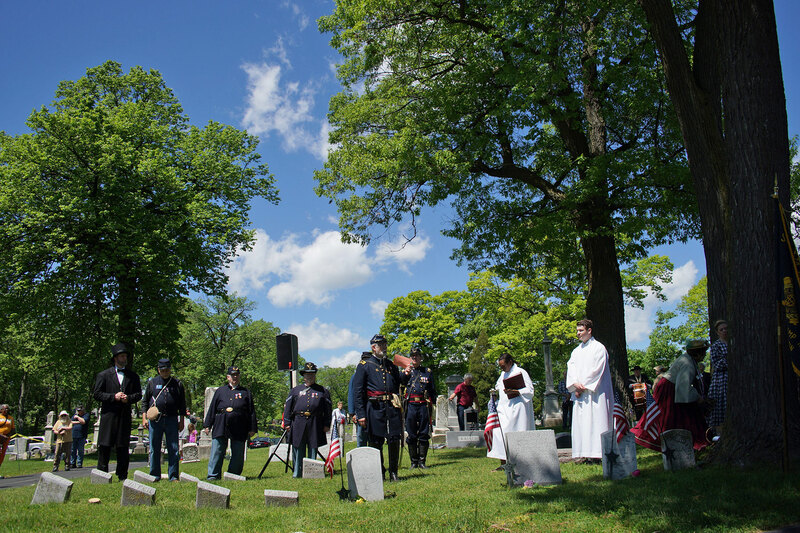 A crowd of hundreds attended a May 29 morning outdoor mass at the base of the hilltop chapel and then stayed for the patriotic program, that featured an address by President Abraham Lincoln played by Nicholas Bur. 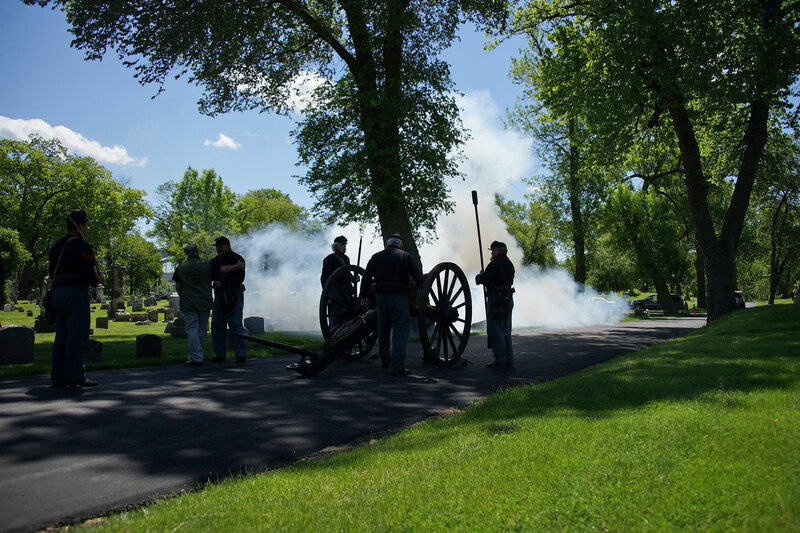 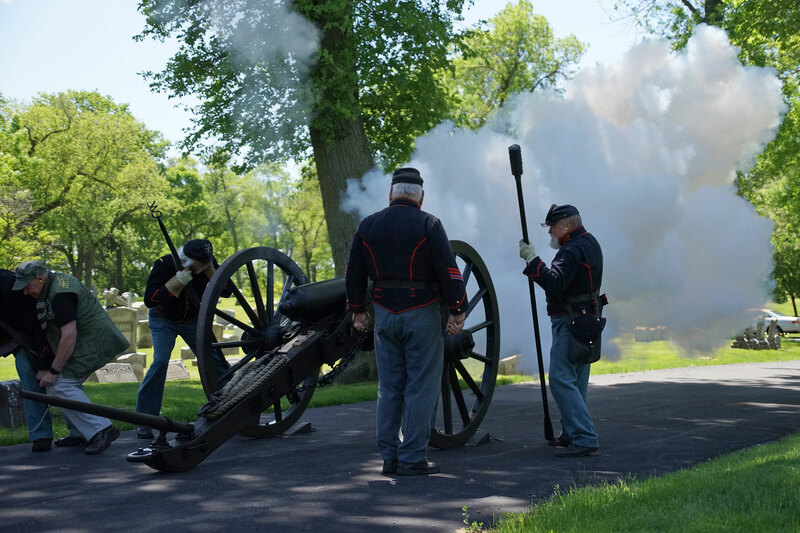 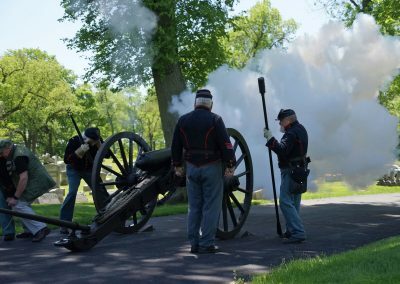 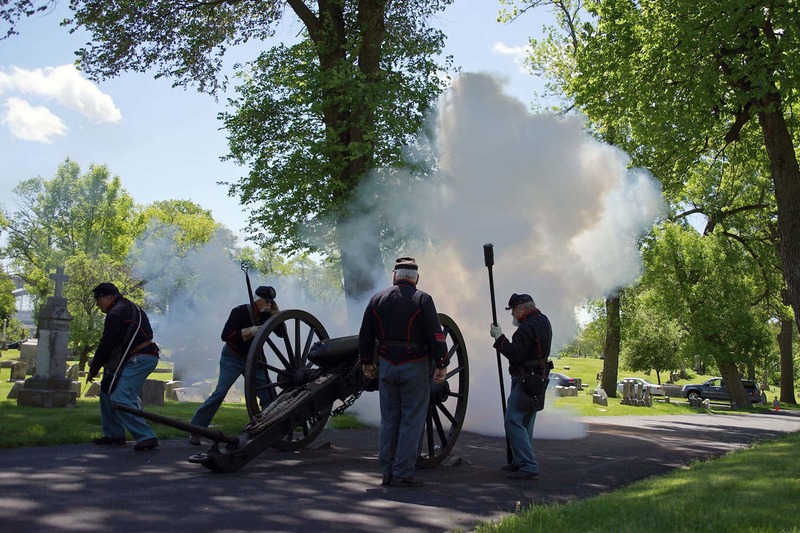 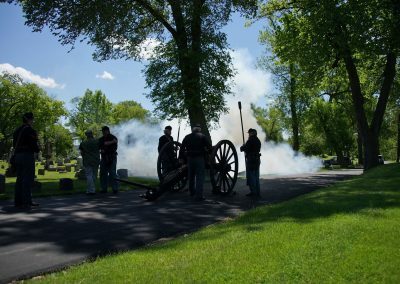 A military salute was performed with cannon fire from Cushing’s Battery A – 4th U.S. 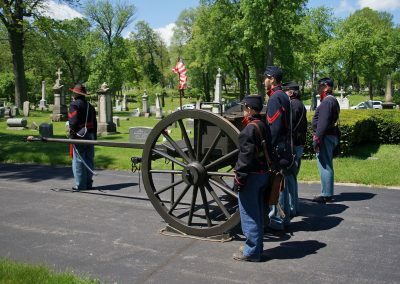 Artillery, along with a Civil War musket and American Legion rifle salute. 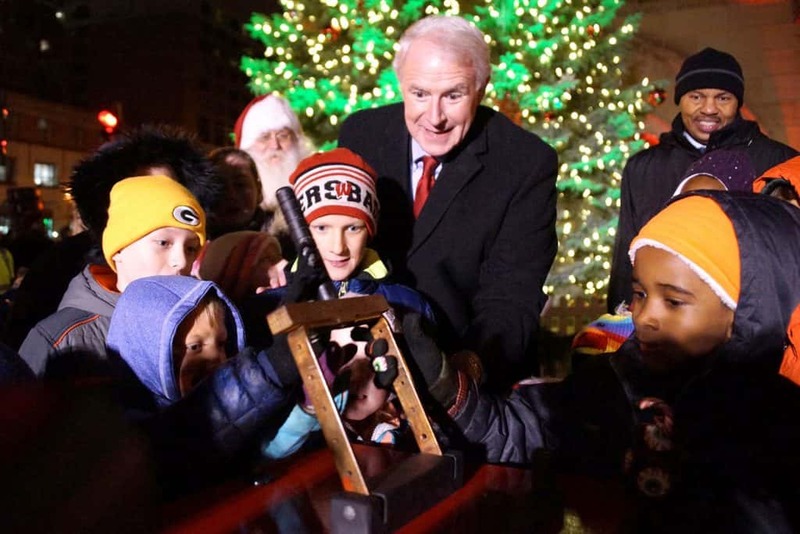 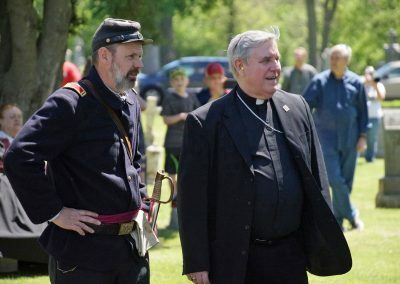 Archbishop Jerome Listecki, a retired lieutenant colonel who led the faith service and served for 20 years as a chaplain in the U.S. Army Reserves, pulled the firing cord of the first cannon volley. 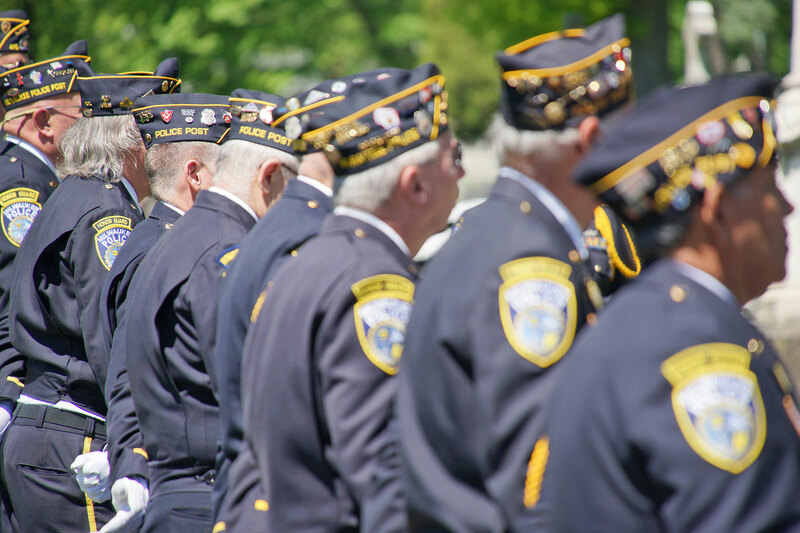 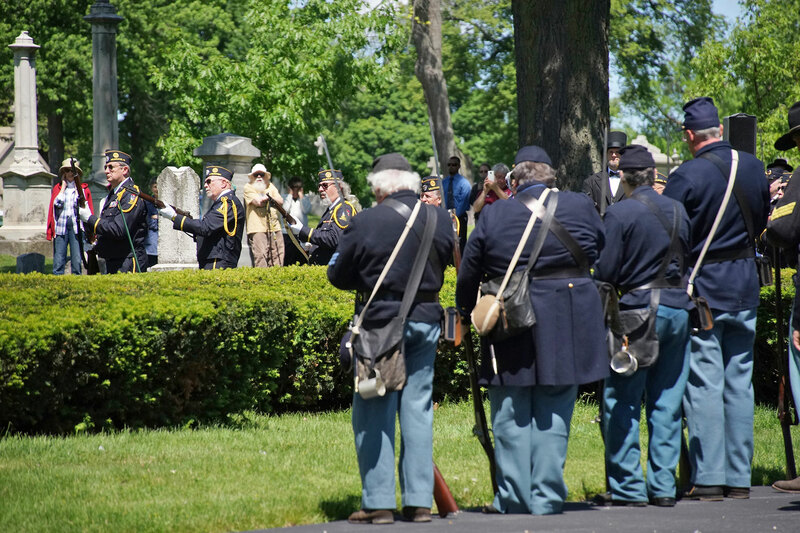 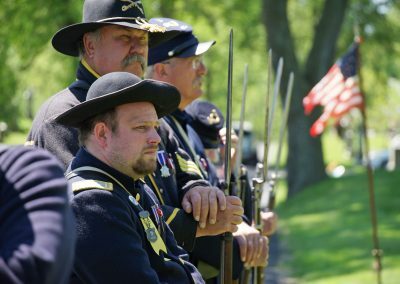 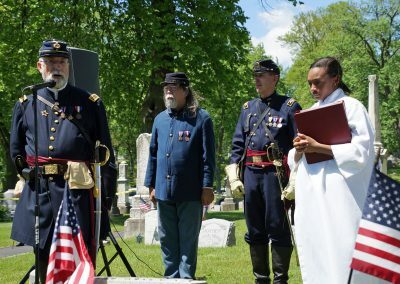 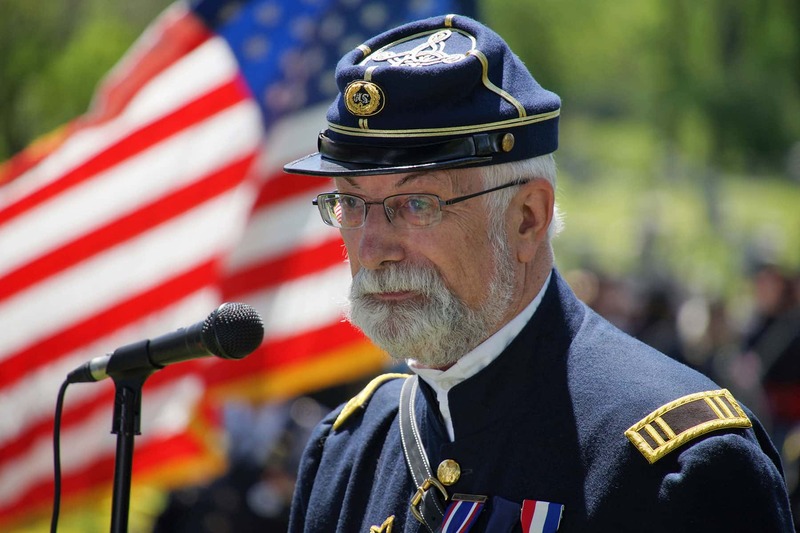 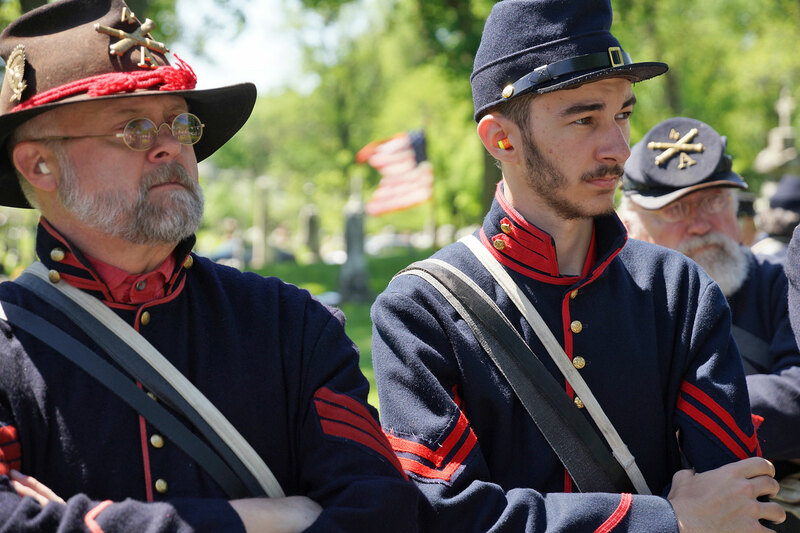 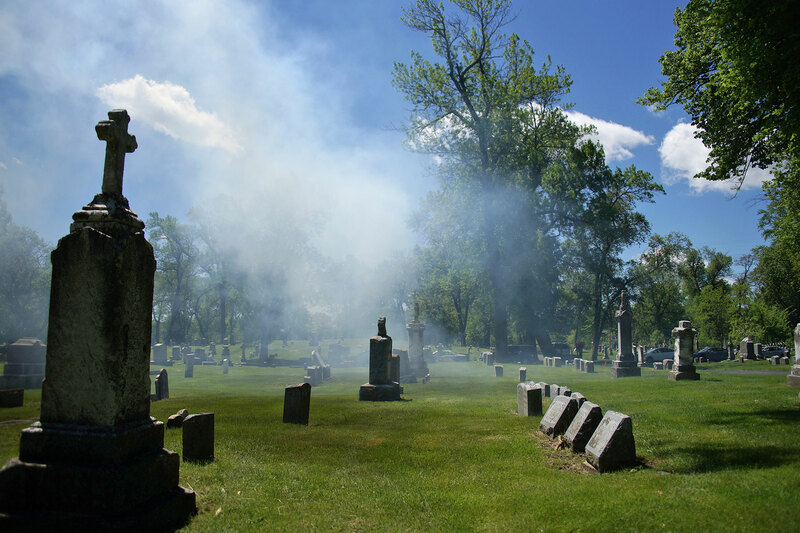 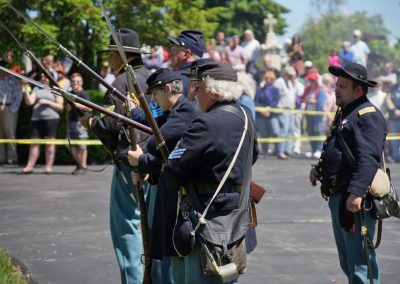 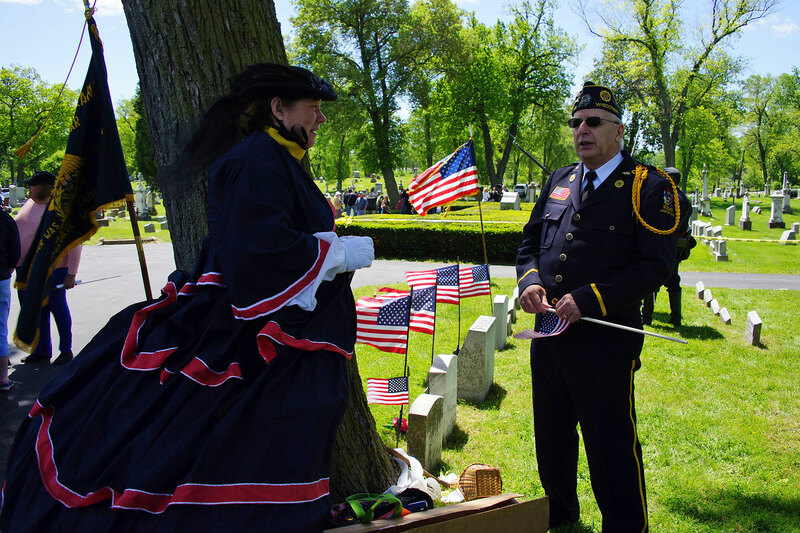 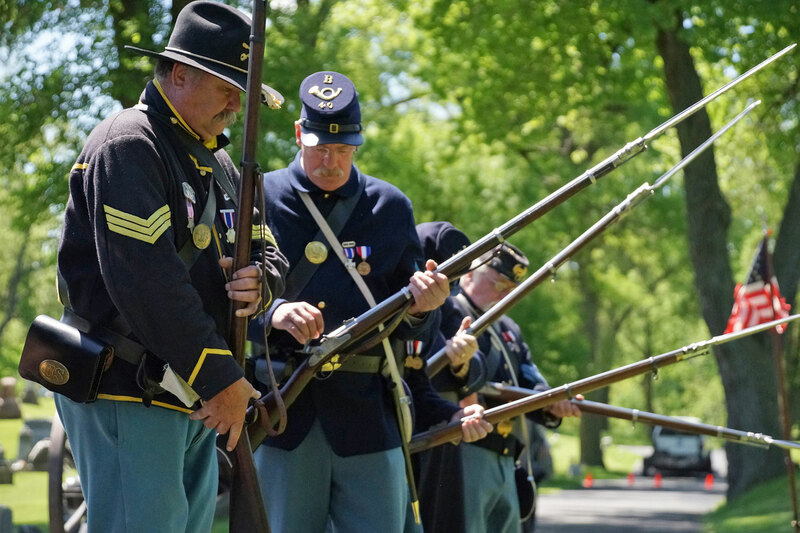 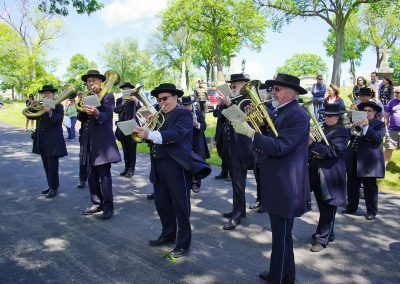 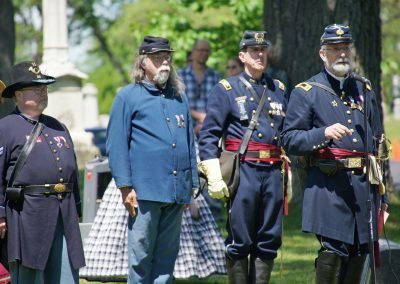 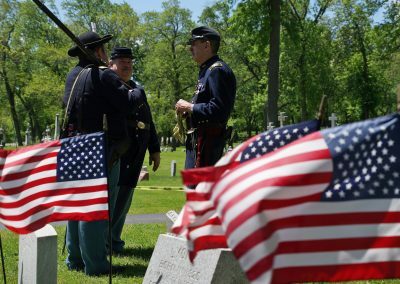 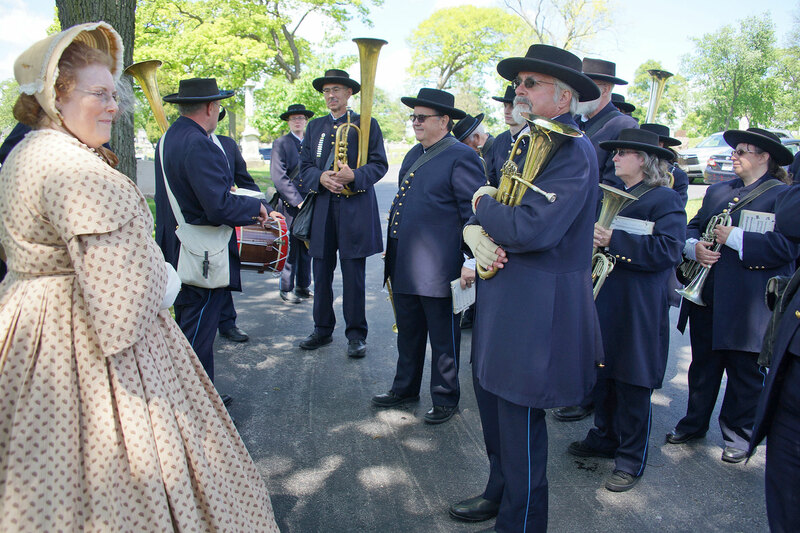 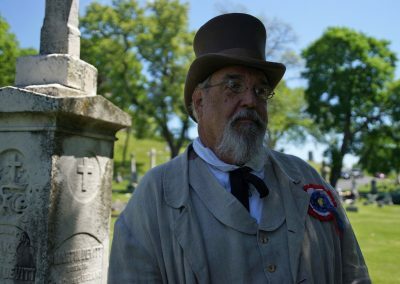 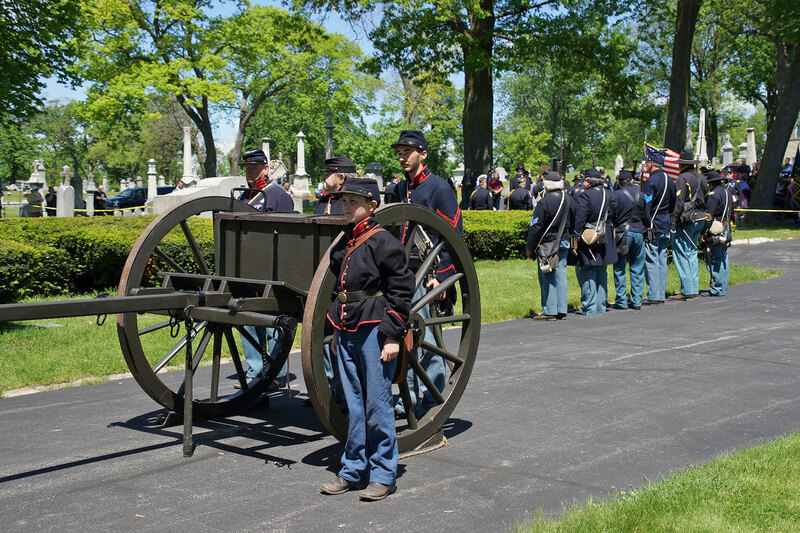 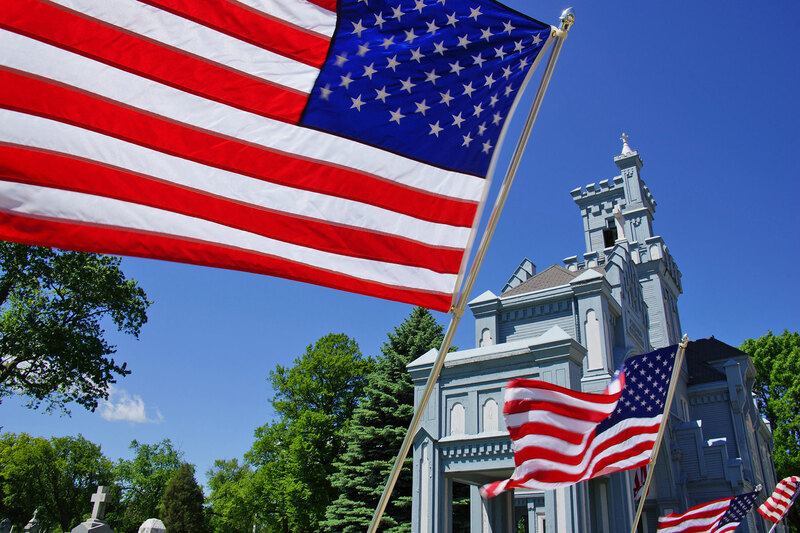 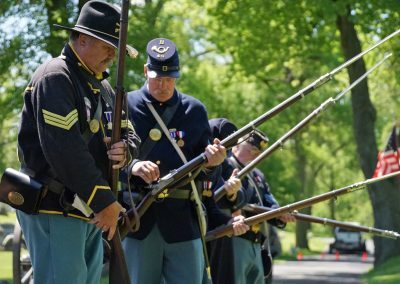 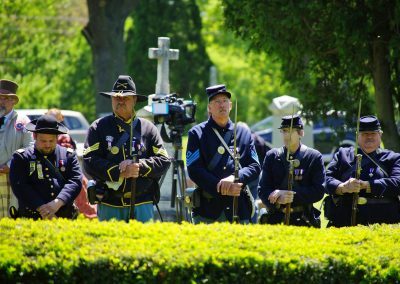 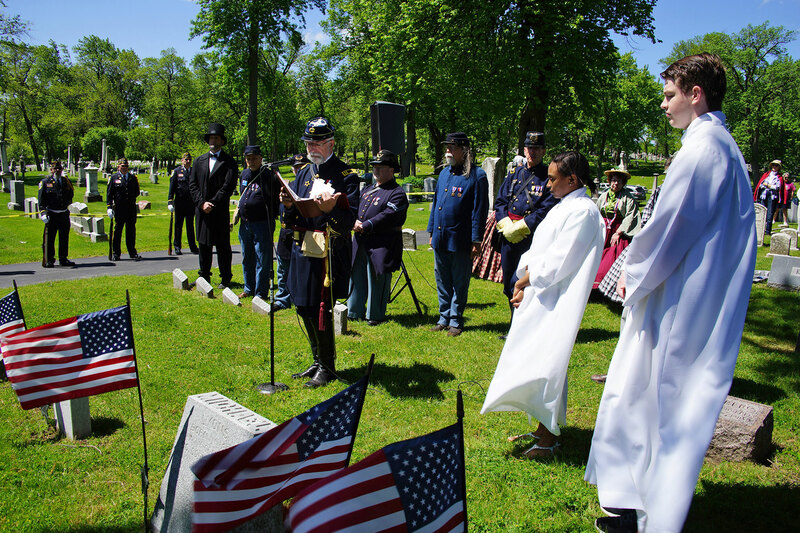 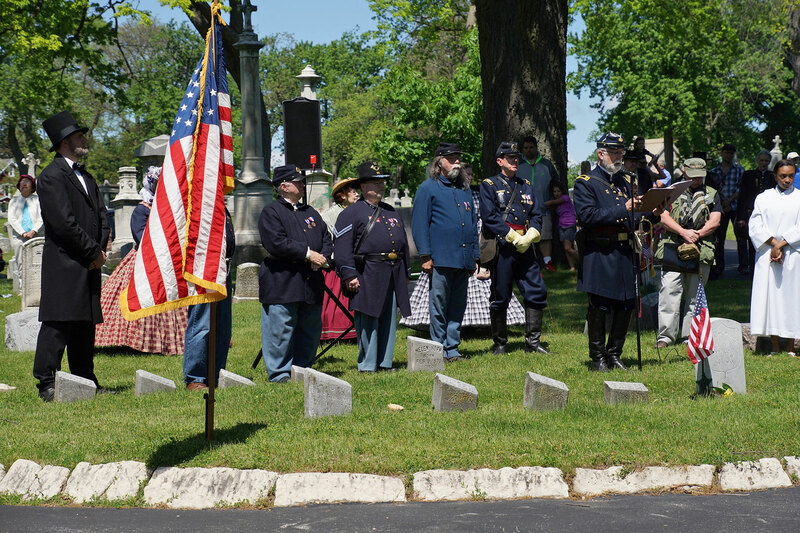 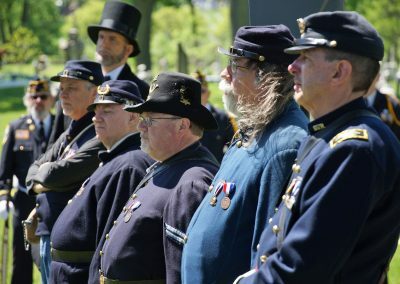 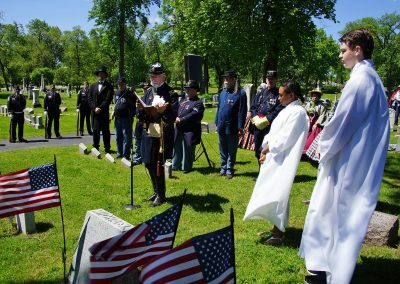 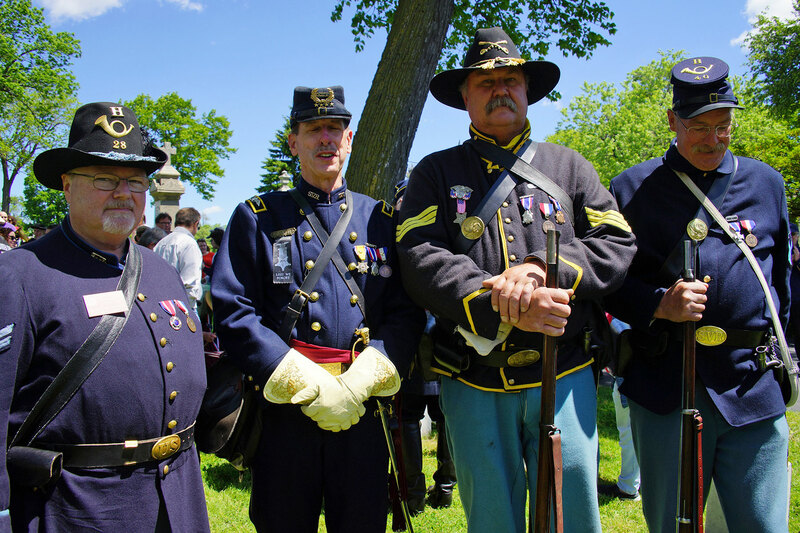 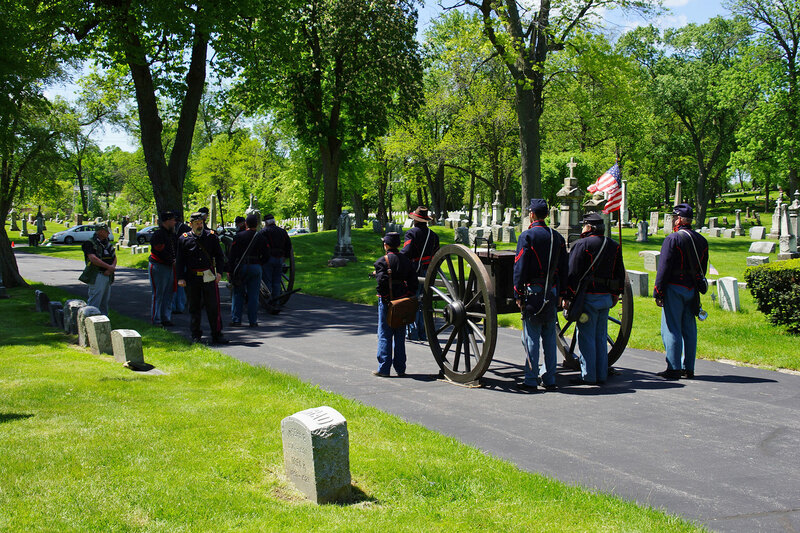 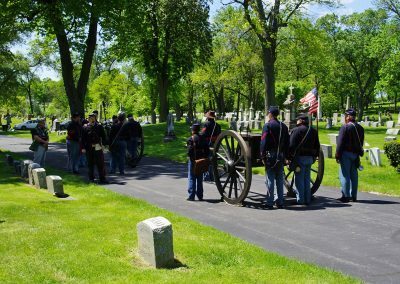 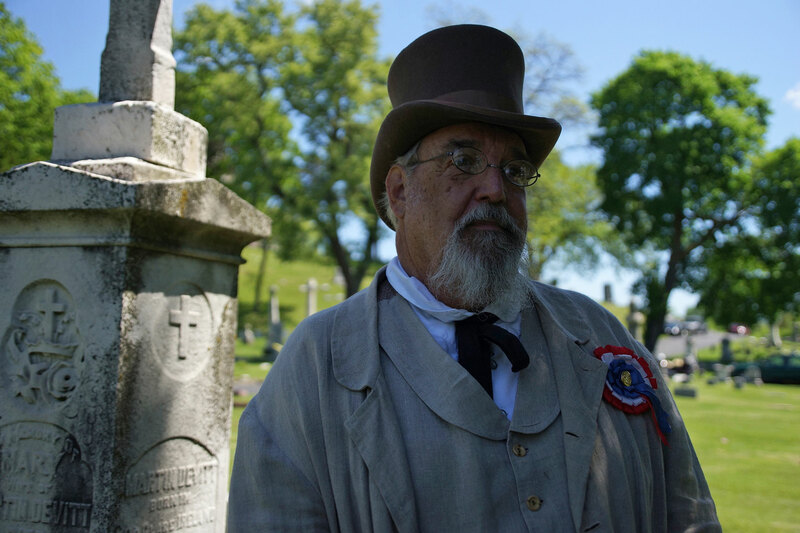 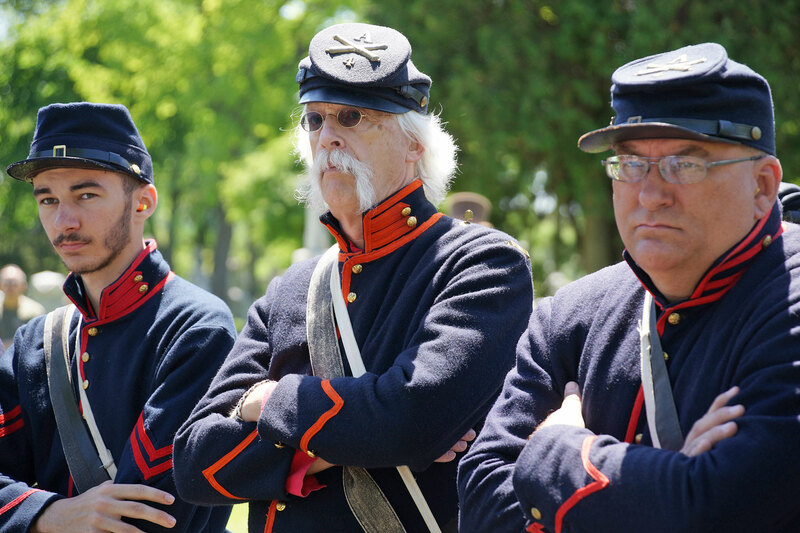 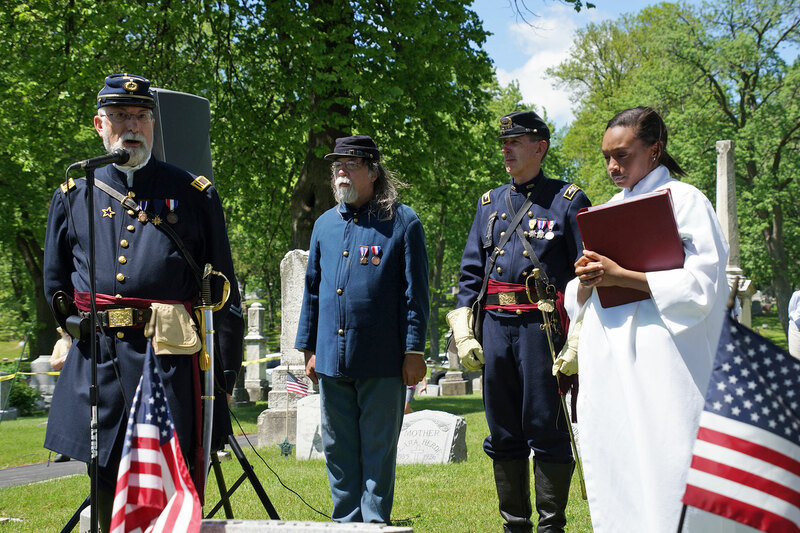 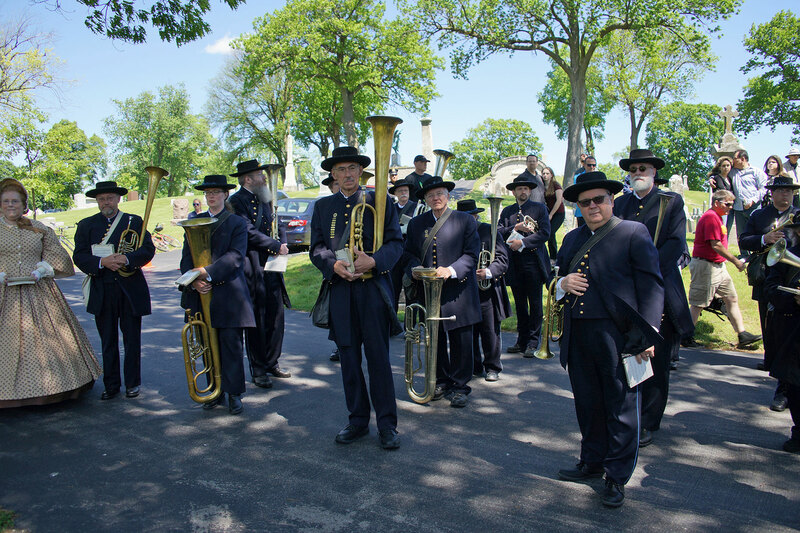 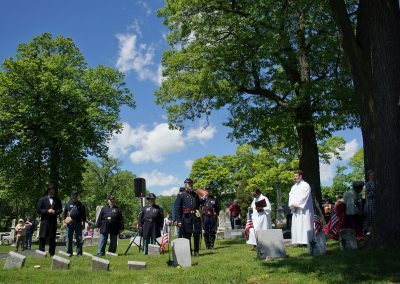 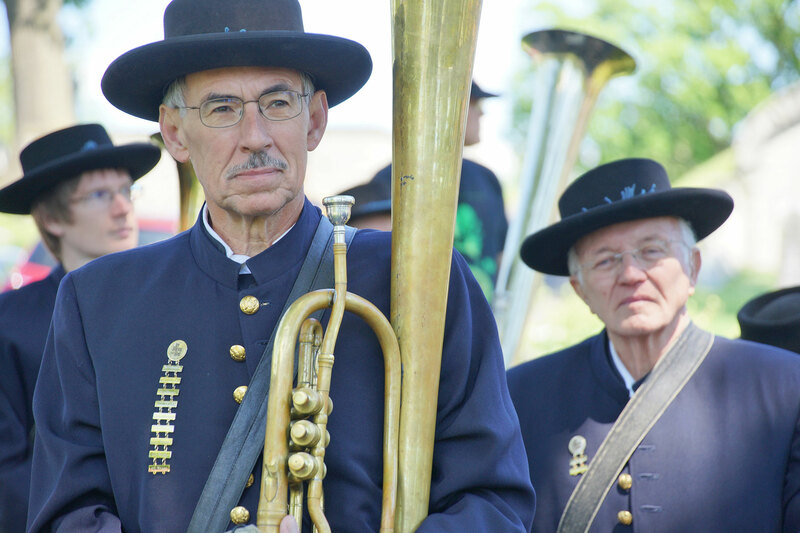 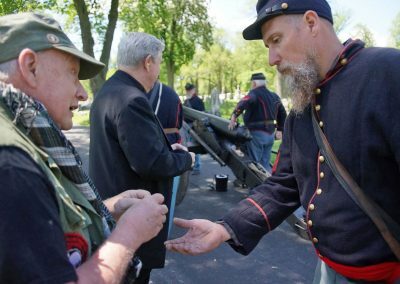 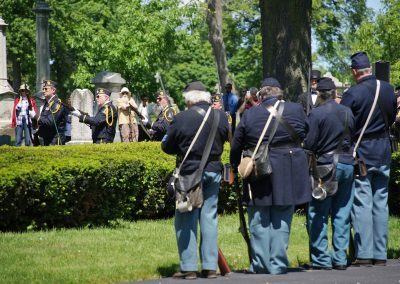 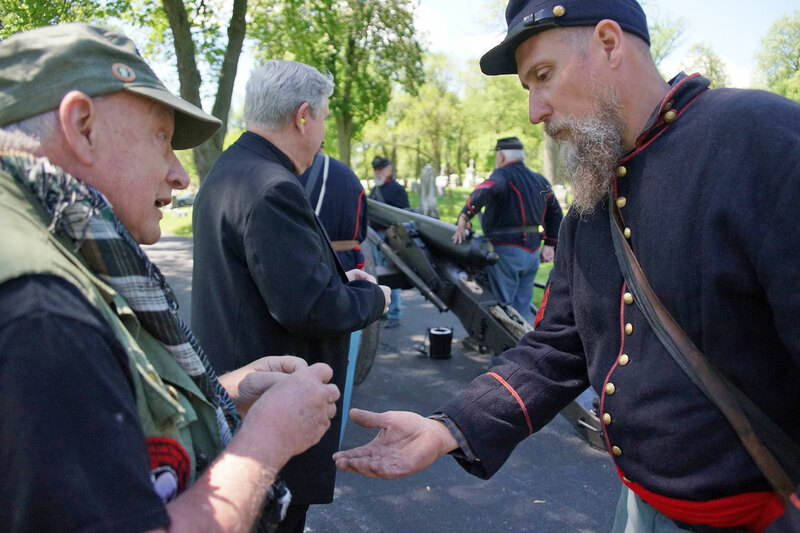 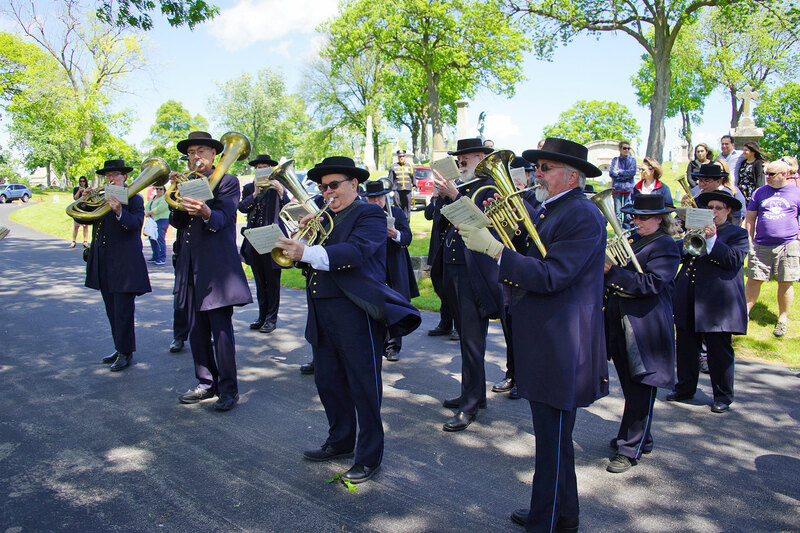 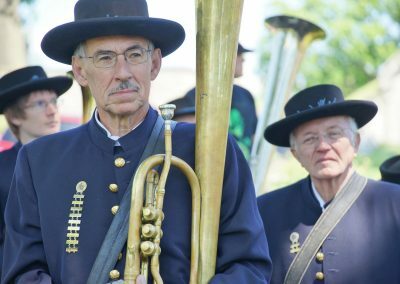 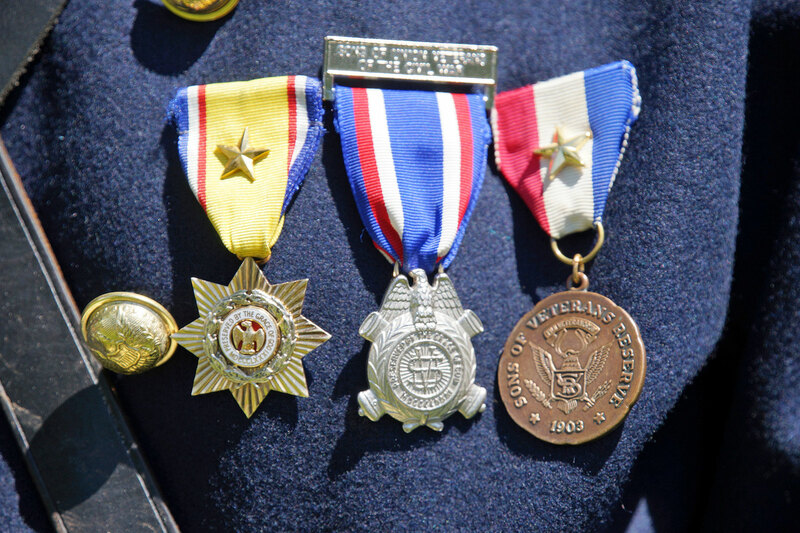 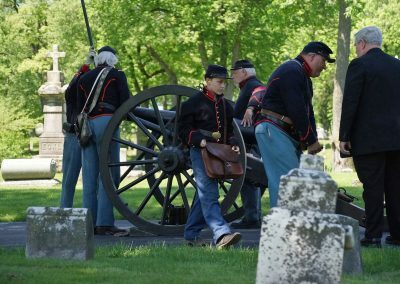 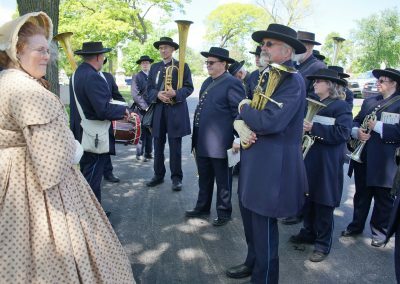 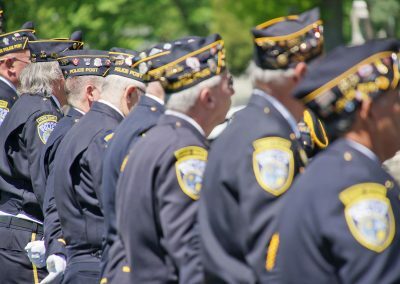 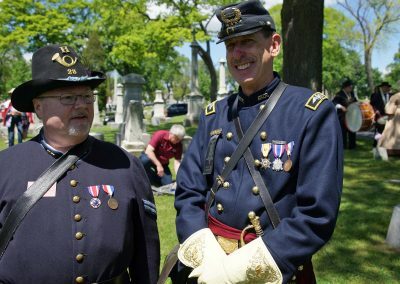 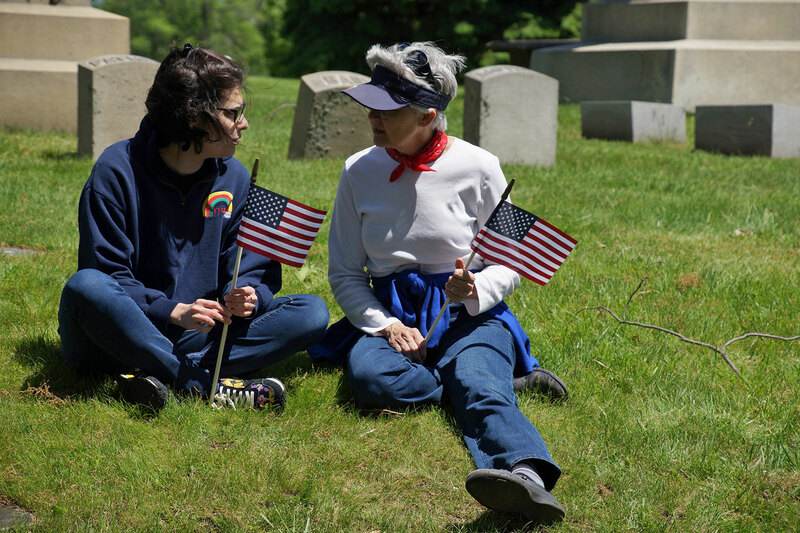 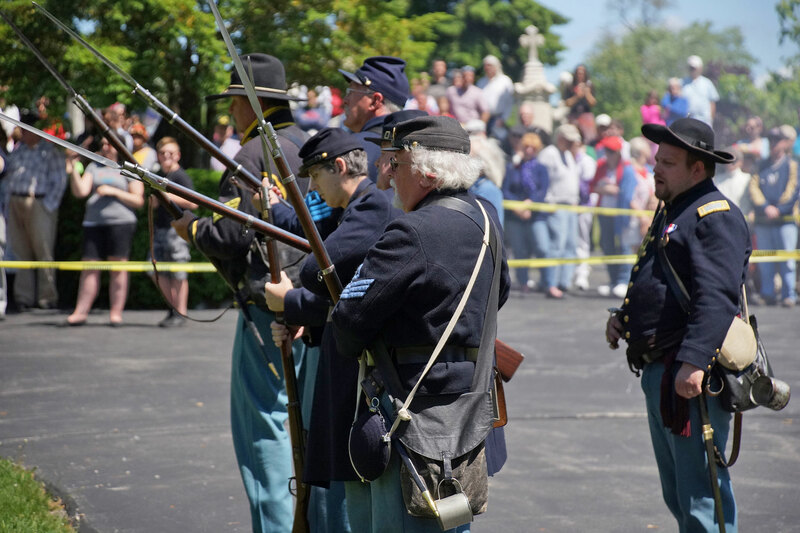 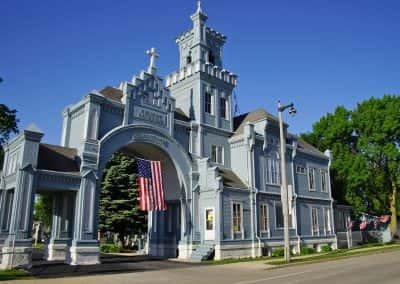 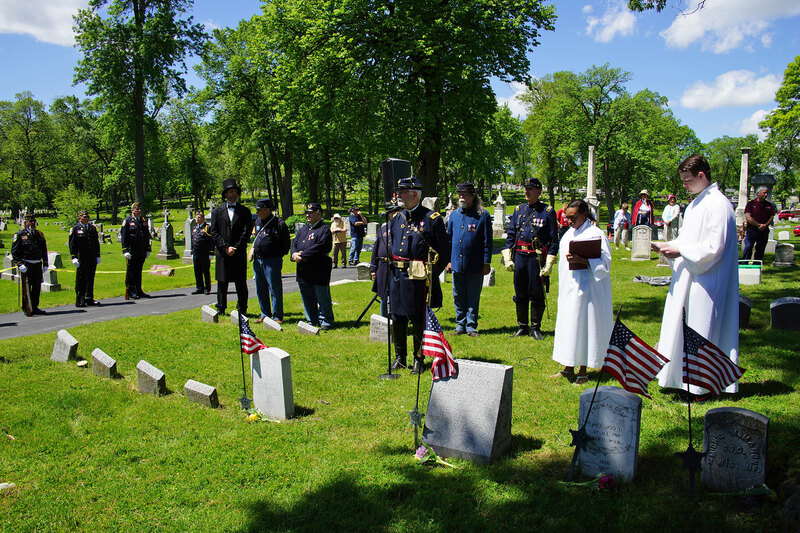 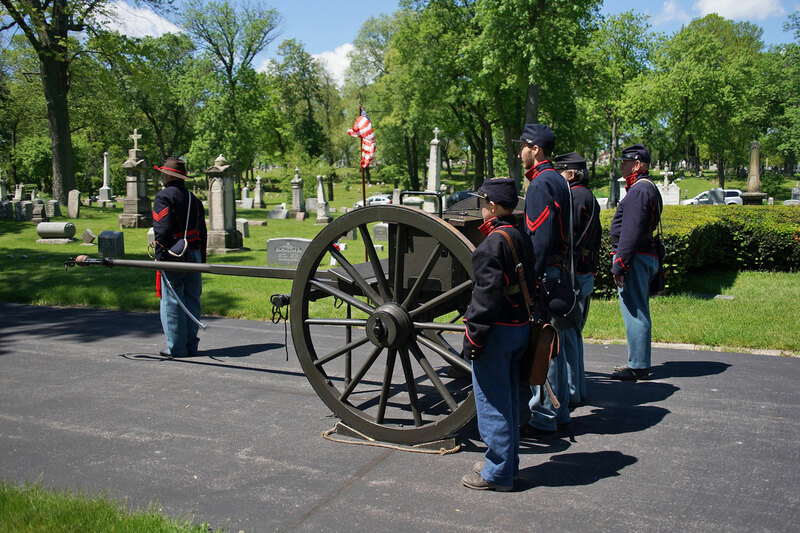 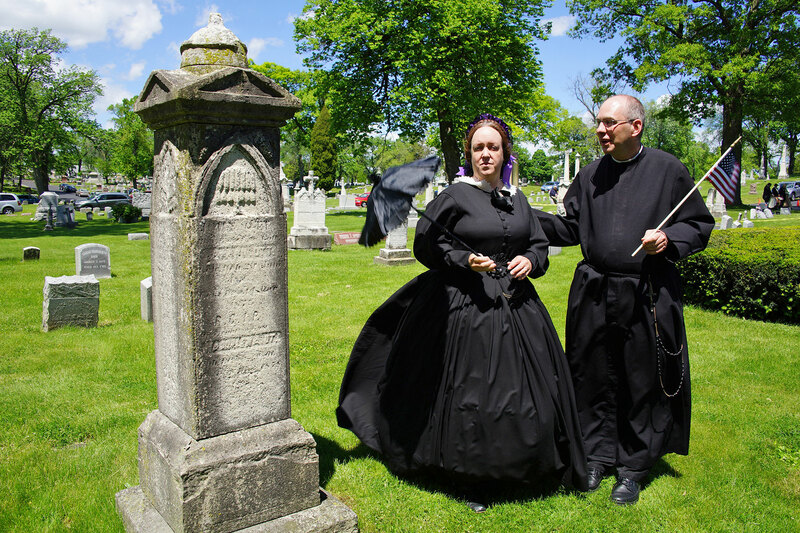 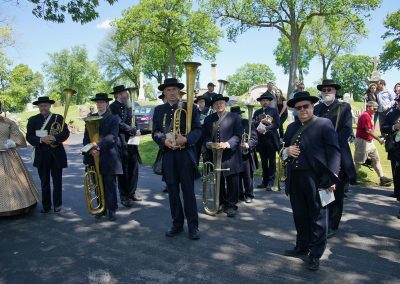 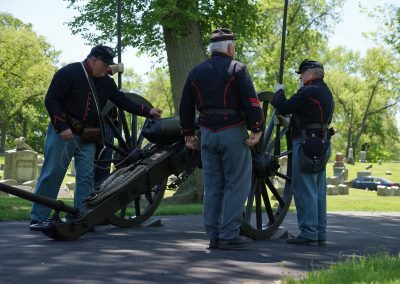 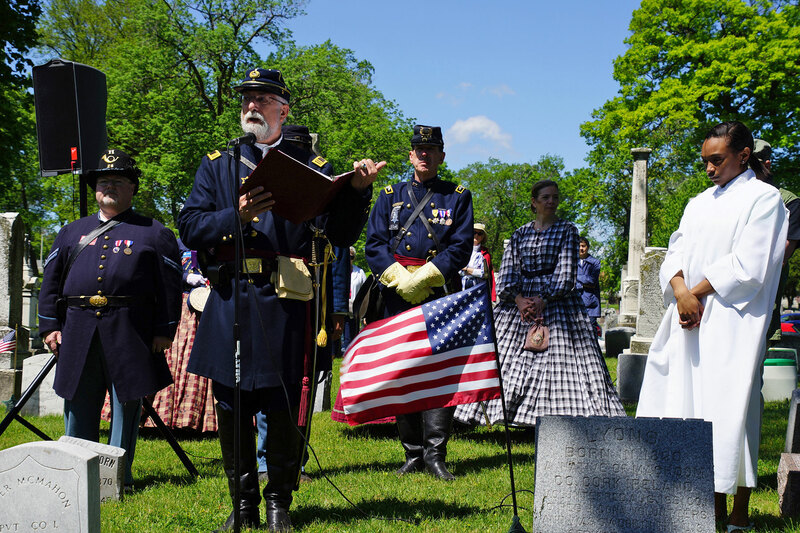 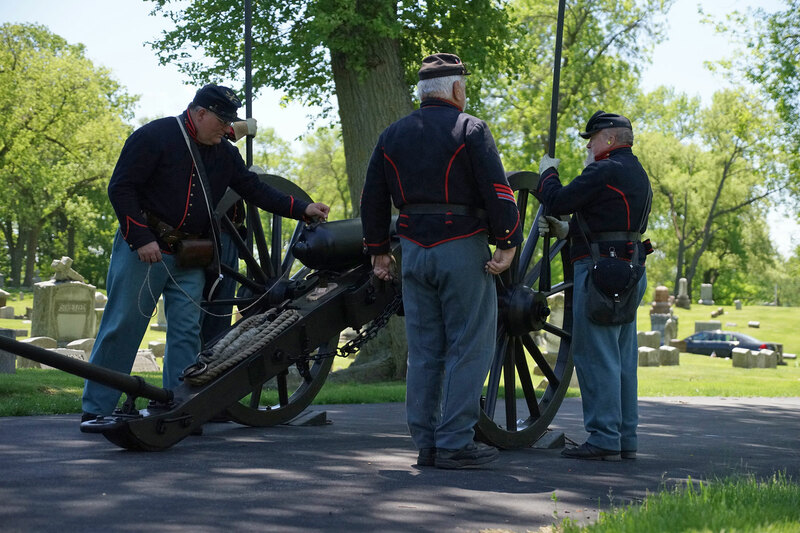 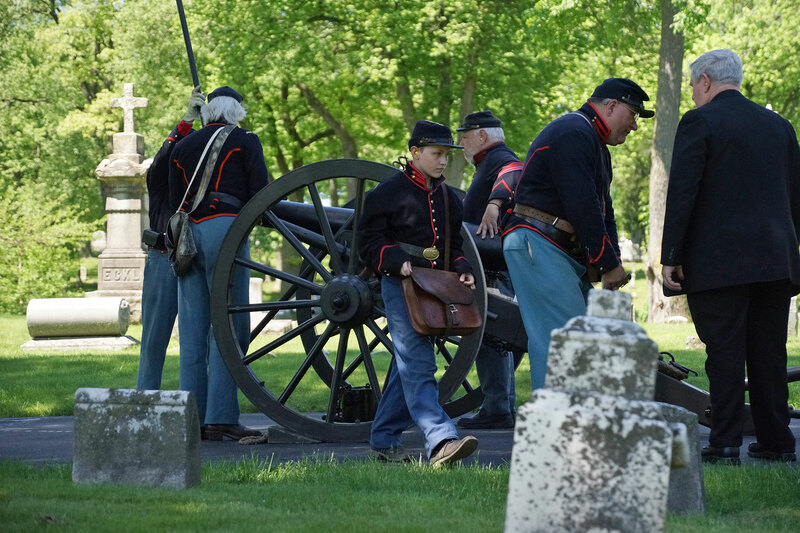 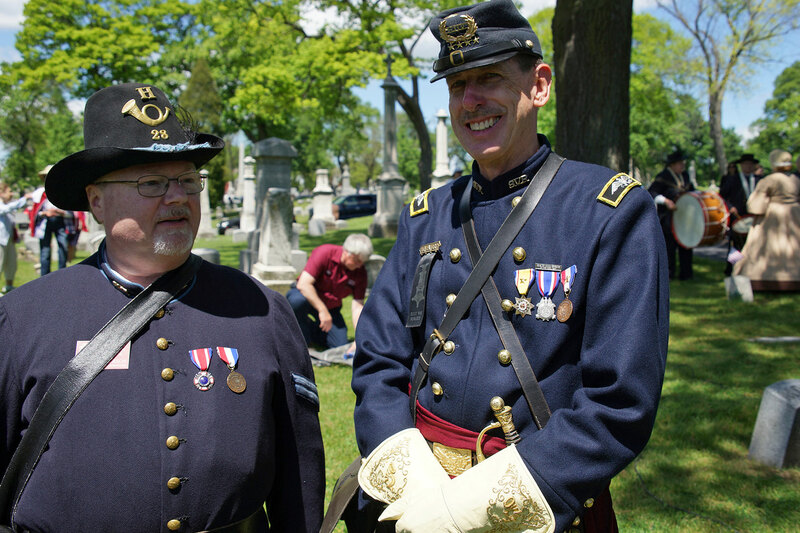 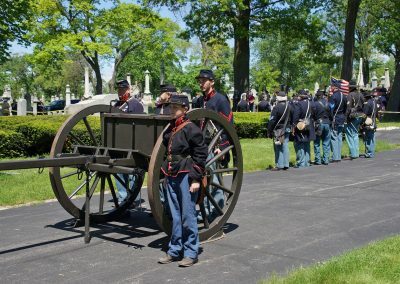 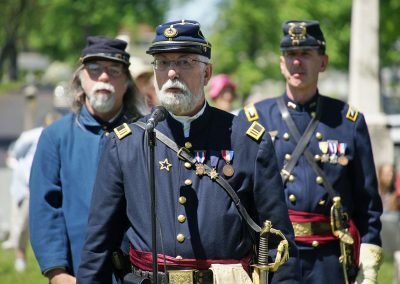 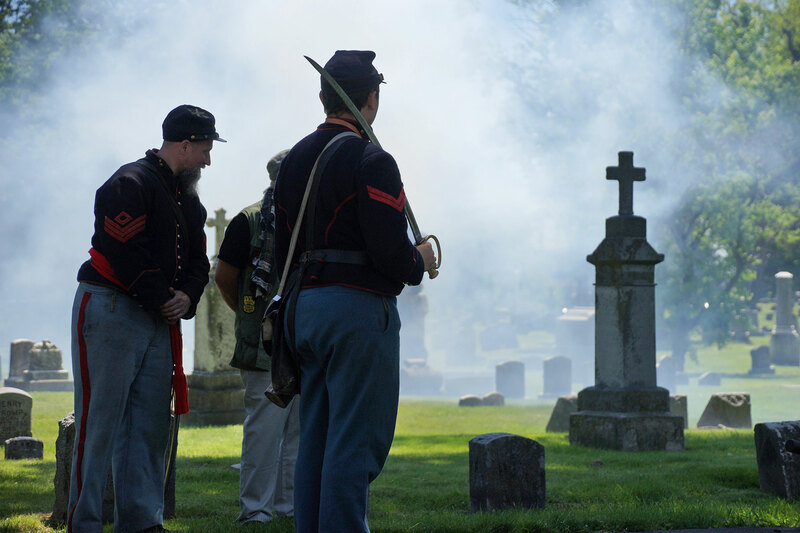 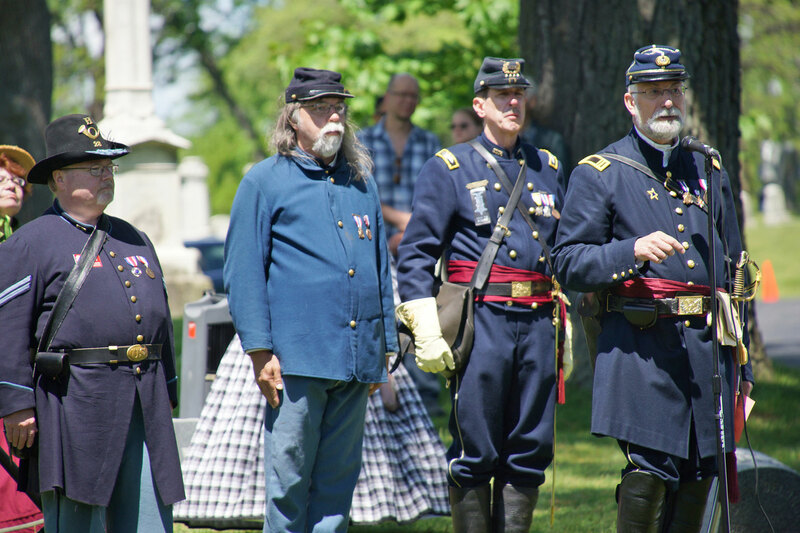 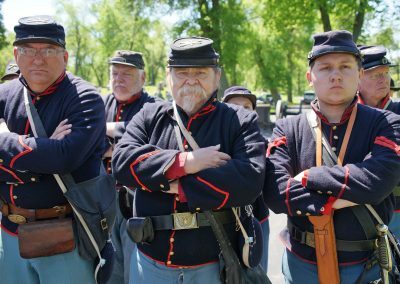 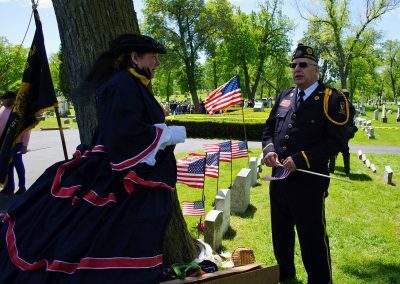 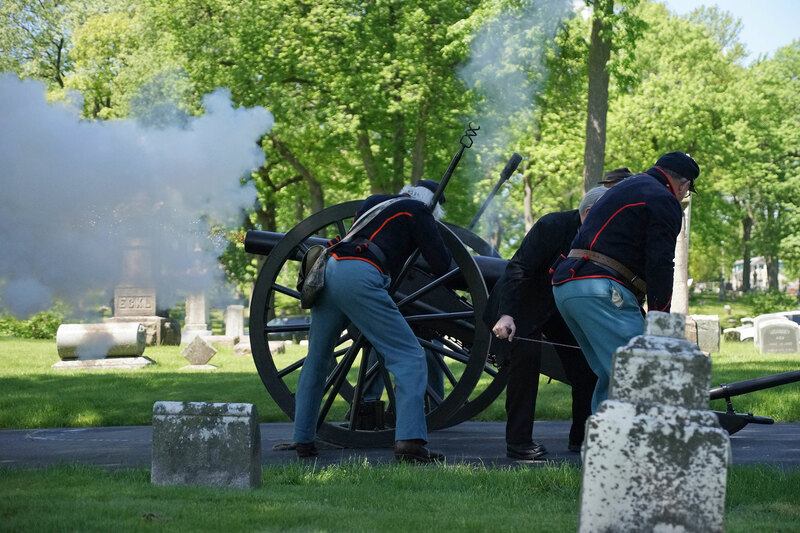 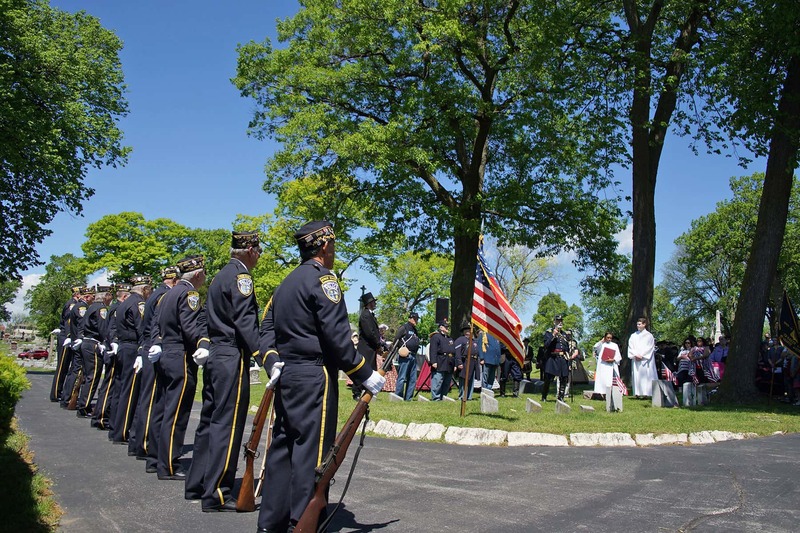 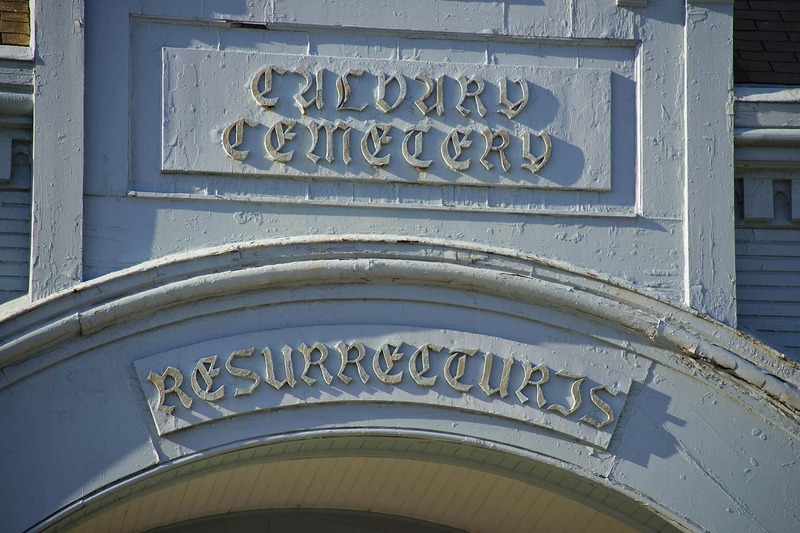 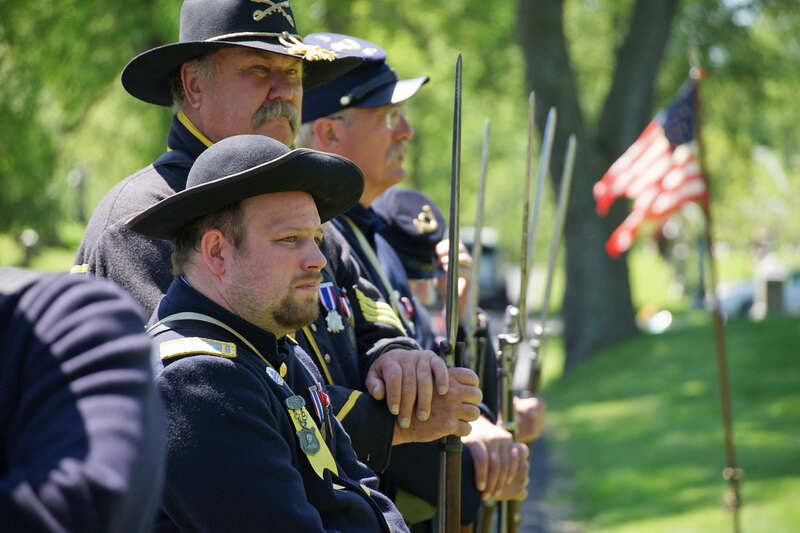 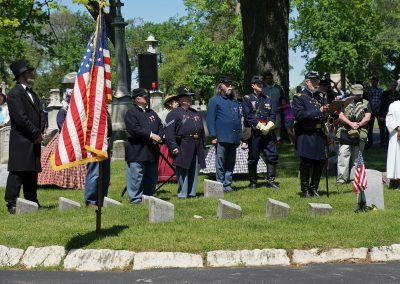 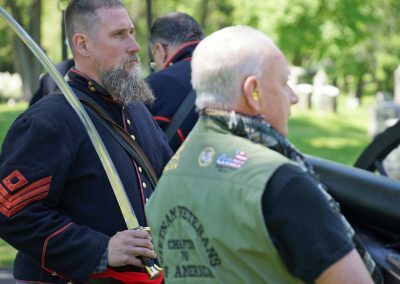 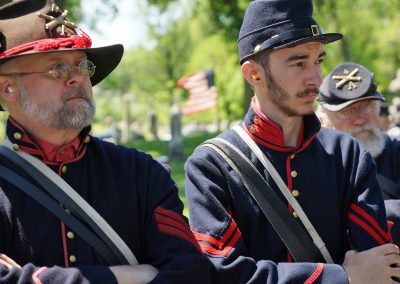 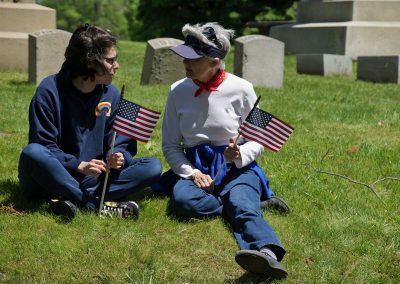 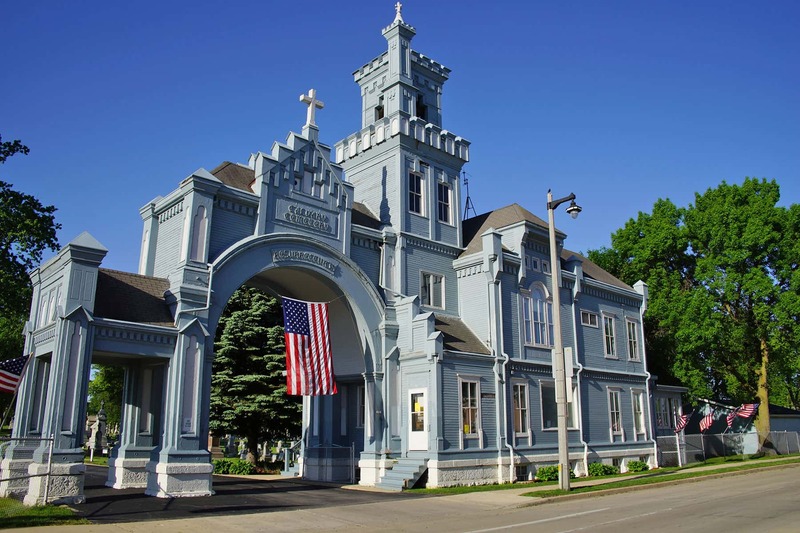 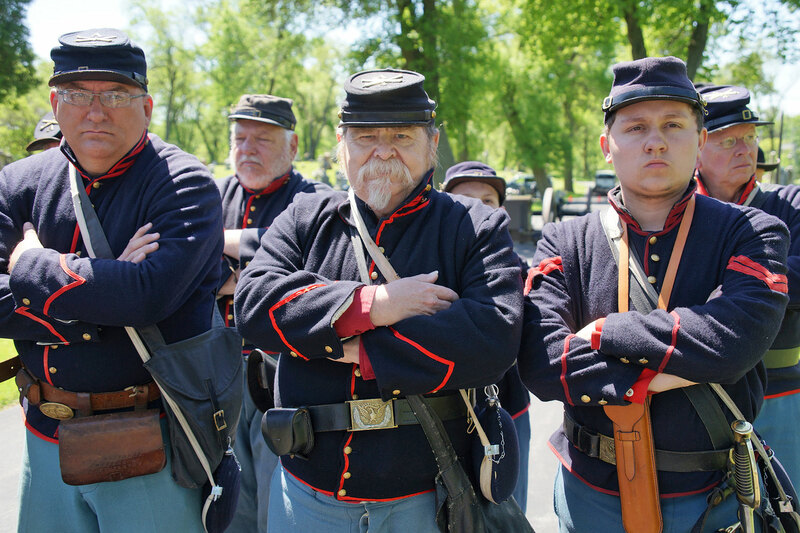 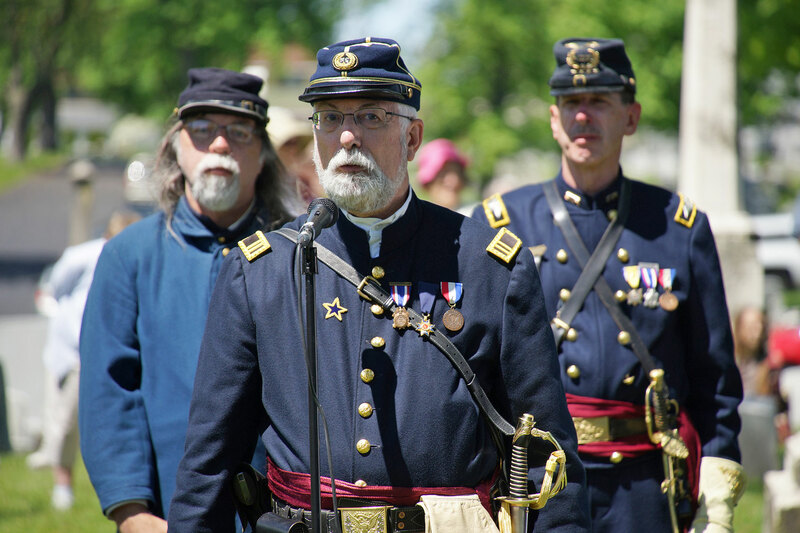 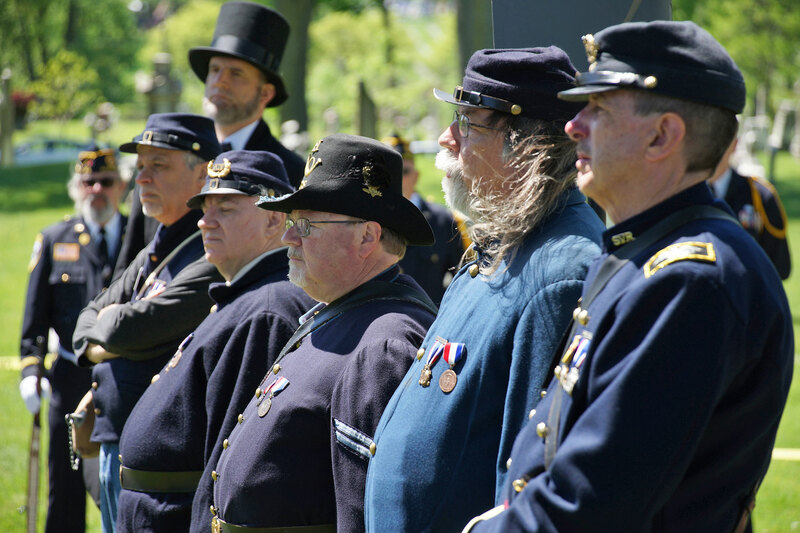 Two Medal of Honor recipients and more than 200 Civil War veterans are interred at Calvary Cemetery, located just north of Wood National Cemetery across the I-94 highway. 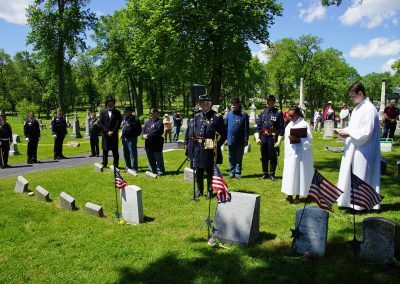 On June 12, 2016 SUVCW dedicated a historical marker for Civil War veterans buried at Forest Home Cemetery. 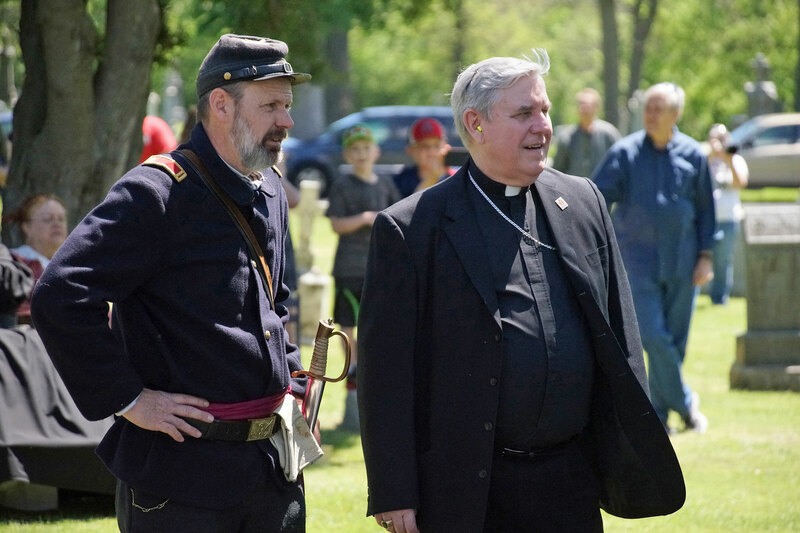 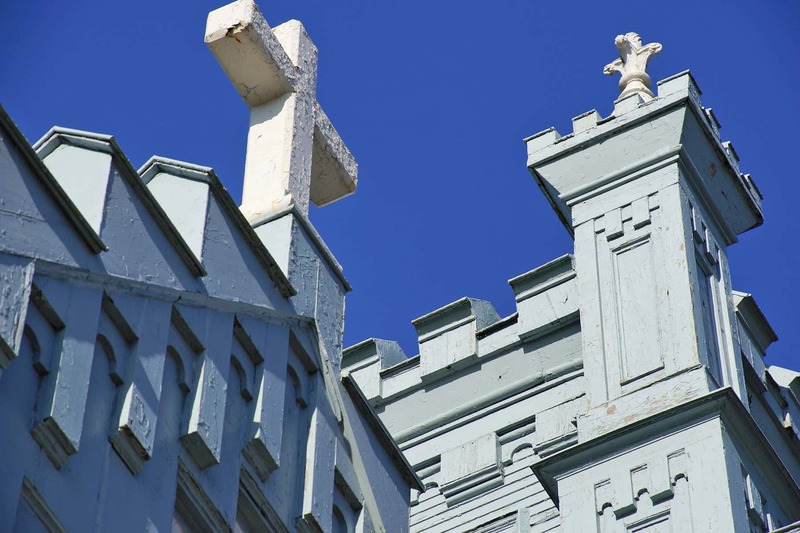 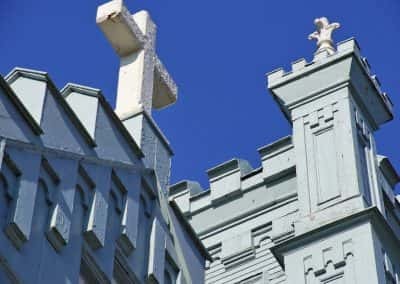 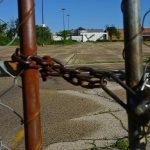 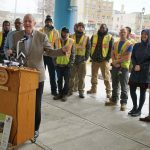 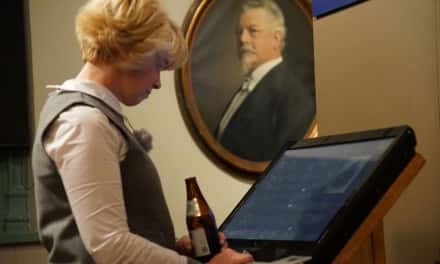 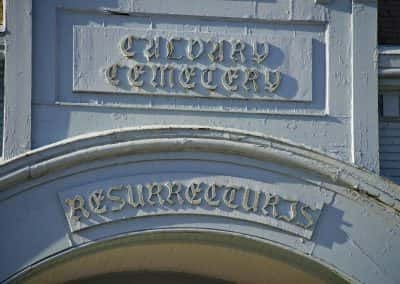 Deacon Dean J. Collins, a direct descendant of a Civil War veteran, told the attending crowd that the group had hopes to secure funding for the placement of a similar marker at Calvary in the near future. 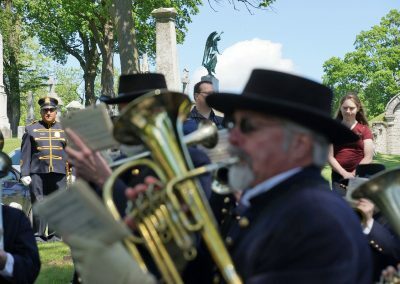 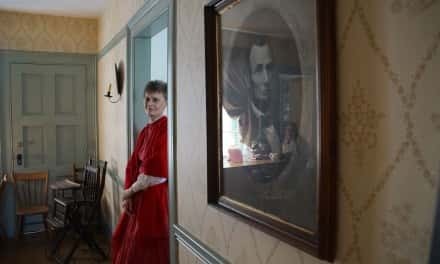 These images show portions of the patriotic program and historic tribute to Union soldiers, for which the tradition of Memorial Day began as a way to remember the country’s losses from its devastating Civil War, and additionally honored all the Americans who have since fallen while defending the country.